A great part of the imaginative appeal of the past is its violence. Historical bestsellers, more often than not, are focused on wars; historical re-creation groups commonly emphasize combat, from medieval tourneys to the Civil War. But the actual details of combat, on the battlefield, in formal duels, or in street brawls, aren't so well known. Scholarly historians seldom discuss them, leaving their readers to gain their impressions from fiction and drama — though centuries of dramaturgical traditions, from Renaissance stage fencing to Hong Kong wirework martial arts, have unanimously favored techniques that look impressive and are easy to follow, at whatever cost in actual combat effectiveness. Part of the problem is that the historian's job is to find out what actually happened. Transposing contemporary techniques into the past, or inventing plausible theories, or telling good stories, do not produce historical fact. But the evidence that could provide raw material for historical fact is unfortunately scarce. Many skilled fighters never tried to write down the details of their skills, believing that the only way to learn them was by using them; and those who did weren't necessarily skilled at defining their subject for completely uninformed readers. Happily, Sydney Anglo has had the patience to review the manuals of combat techniques from the age of swordsmanship in Europe, and the skill to digest them for present-day readers. The result, The Martial Arts of Renaissance Europe, is a quite fascinating book. Anglo in fact starts out with the challenging problem of notation and illustration of combat movements, discussing the various combinations of words, pictures, geometric diagrams, and abstract notations that appeared in manuals of arms over several centuries. But he goes on from there to consider the substance of his topic and its larger context. The theme that emerges over and over from these books is that swordsmanship was not being taught as an elegant exercise, but as a matter of life and death. When someone else took sword in hand and approached you, the classic teachers said, you had to treat it as a threat against your life, "for hee hath not his weapon drawen to no purpose." The primary purpose for learning to use swords and daggers was self-preservation. And since threats could be offered almost anywhere, the serious swordsman couldn't assume such refinements as a level surface, reliable footing, or equality of weapons; rather, he had to be prepared to turn any circumstance to his advantage. For the same reason, he had to be willing to use a variety of techniques. The books Anglo surveys didn't confine themselves to using swords on foot; they also discussed mounted combat, the use of weapons other than the sword, from daggers to pikes, and fighting with bare hands. Anglo quotes one master who discussed the advantages of throwing one's ale in an adversary's face and then kneeing him in the groin! If a man lost his sword, he would have to use any other available weapon, or his bare hands, to prevent the other man from killing him. All of this has a flavor much more of contemporary self-defense training than of the salle d'armes or the dojo. Incidentally, Anglo clearly has the comparison with East Asian martial arts very much in mind, as his title hints. At several points he remarks on Renaissance combat moves that would now be thought of as quintessentially Japanese or Chinese. The other point that emerges from this book is how ambivalent past centuries were about all these combat skills. Martial arts masters might explain that their arts enabled a man to come to the service of the state already trained for war, and to protect himself against criminals. But governments of the period mistrusted these claims, being more aware of the use of combat skills and weapons to intimidate the innocent. Such concerns led at times to paradoxical laws, as when the teaching of swordsmanship was banned in London — except that men imprisoned in the Tower of London, and facing trial by combat, might be allowed to go out into the city at regular intervals for lessons in more effective fencing! All of this, both the conflict and the oddities of logic, has a very contemporary feel, which more than anything else makes it plain that the sword played the same role, or roles, in the life of the Sixteenth Century that the handgun does in the life of the Twenty-First. Anglo himself is a good enough writer to bring this all to life; and the numerous illustrations reproduced in his book enhance the sense of immersion in the life of past centuries. 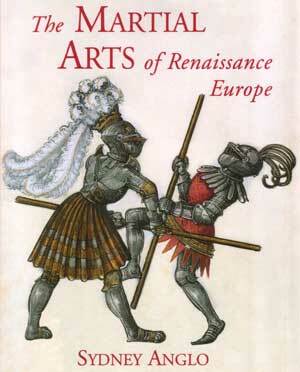 I recommend The Martial Arts of Renaissance Europe to anyone who finds that prospect appealing.